I love Thai food. I am not sure how that love came about, but it is a done deal now. Thai food makes me happier than a pig in the mud. It is the yin to my yang, Thai food completes me. I could wax on rhapsodically about Thai food and the happy feelings it brings about in me…but I will just say I ❤️ Thai food and leave it there. But ooh I might need a bumper sticker that says Cajun Mama ❤️ Thai food for my mini van. Or would that be a little too much? Get your rice cooking in a rice cooker or a pot on the stove. I made 1 1/2 cups and that was about right. In a large skillet, melt your butter. 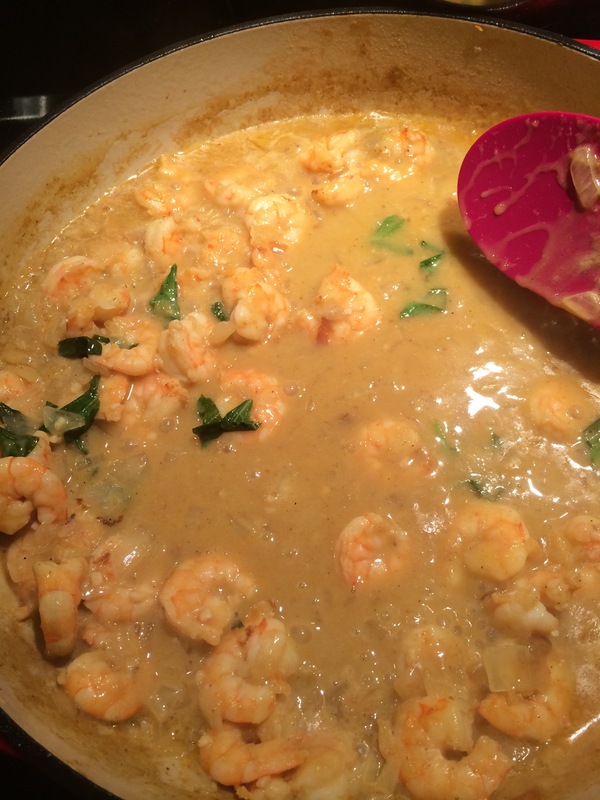 Toss in your shrimp and cook until they are opaque or as I call it…lovely cooked shrimp color. There is a fine line between cooked just right shrimp and overcooked shrimp so kind of watch them. For medium size shrimp, a few minutes is really all it takes. Now, remove those pretty opaque cooked just right shrimpies and put them on a plate. Set aside. I have to hide them at this point because big daddy starts sneaking them. Now, stir in some honey (about 2 tablespoons) for some sweetness. Squeeze in the lime juice. See where we are going here? Oh yes somewhere lovely. Thai town, curry ville, my happy place. Ok, now at this point I added a few squirts of Sriracha sauce. If you have never used this stuff before, use sparingly at first. It is some good stuff though y’all. Used to it could only be found in certain stores, but now it is pretty much in every store on the ethnic foods aisle. Buy some. It’s awesome sauce. Now, stir in a little kosher salt. And let all this loveliness simmer for a few minutes. Feel free to add more honey, lime juice, Sriracha sauce, and salt to get it to taste just right. Sprinkle in more curry powder if necessary. Clip some of those fresh, fragrant basil leaves and kind of give them a little chop and stir them into that lovely curry sauce. It will taste sweet and savory at the same time, which in my humble opinion, is the beauty of Thai food. Now, stir your shrimp into this luscious concoction. Serve over cooked rice. Garnish with a little extra basil. Just beautiful, ya’ll. Heaven in a bowl my friends. Heaven in a bowl. Thank you PW for your guidance in my first attempt at curry cooking. 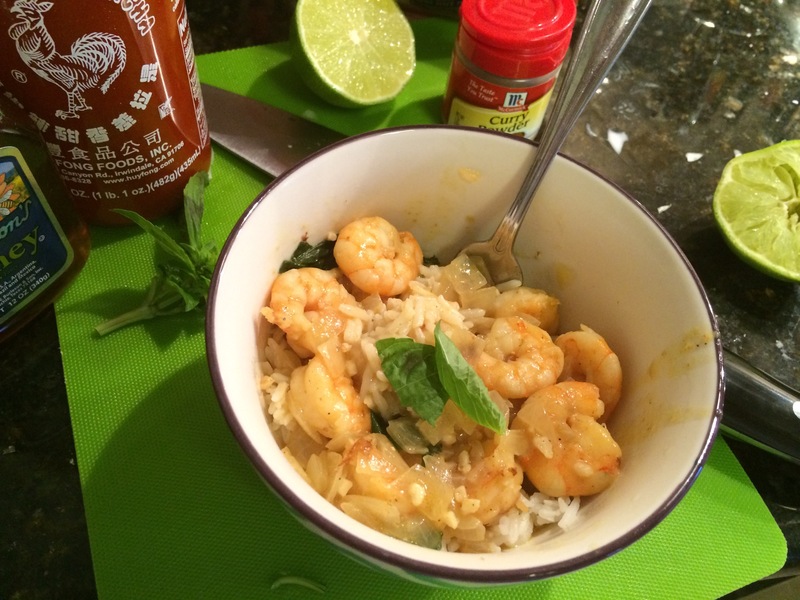 Y’all can check out her post with the most here–http://thepioneerwoman.com/cooking/2014/07/coconut-curry-shrimp/. It’s 9:45 am and all I can think about is eating this dish! Sounds deeelish:) Loved the post my friend! !